Artists throughout history have sought ways to sign their work, either with a signature or a self portrait within the painting (like Raphael appearing inside the “School of Athens”, inside the Apostolic Palace, Vatican Museums). However, Michelangelo was not just another artist of his time, he was a jet setter, he was revolutionary, he was bigger than life, and he never signed his work. Except one. Michelangelo was a young, up and coming artist among many masters of his time. He was 24 years old living in Rome trying to make a name for himself when the young Florentine was commissioned by the French cardinal Jean de Billheres, the French king’s envoy to the pope, to create a Pieta statue for his funeral monument for the chapel of Santa Petronilla in the previous St. Peter’s Basilica.It took Michelangelo two years to carve the statue out of a single slab of Carrera marble, and the result was the innovative triangular composition of absolute anatomical perfection. Michelangelo’s interpretation of the Pieta has been widely considered the greatest sculpted masterpiece ever created and it left the viewers speechless when it was unveiled in St. Peter’s Basilica during the Jubilee of 1500. Michelangelo was an unknown artist at that time, and his masterpiece was mistakenly attributed to another sculptor, Cristoforo Solari. Furious and with a wounded pride, young Michelangelo snuck in when no one was around, and hastily chiseled his name on the sash running across Mary’s chest: MICHAELA[N]GELUS BONAROTUS FLORENTIN[US] FACIEBA[T] – Michelangelo Buonarroti, Florentine, made this. Afterwards, Michelangelo regretted his outburst and vowed to never sign another piece of his work again.Praises also came with criticism towards Michelangelo for depicting an exaggeratedly youthful Mary, appearing younger than the son she gracefully holds in her arms. Michelangelo’s reply was, according to Michelangelo’s biographer Ascanio Condivi, “Don’t you know that chaste women remain far fresher than those who are not chaste? So much more the Virgin, in whom never has the least lascivious desire ever arisen that might alter her body….” Other sources suggest Mary honors Michelangelo’s youthful mother who died when he was just 5 years old. Georgio Vasari, 16th century Italian biographer said of the Pieta: “No sculptor or supreme artist could ever consider it possible to add with design or grace nor with effort improve the elegance, linearity and sculpt the marble with such artistic talent.” Michelangelo’s talent and work has become so well recognized world wide that his signature has never been necessary after that.You can see the Pieta in St Peter’s Basilica, behind the glass inside the Pieta Chapel. It was placed in this chapel in 1749. 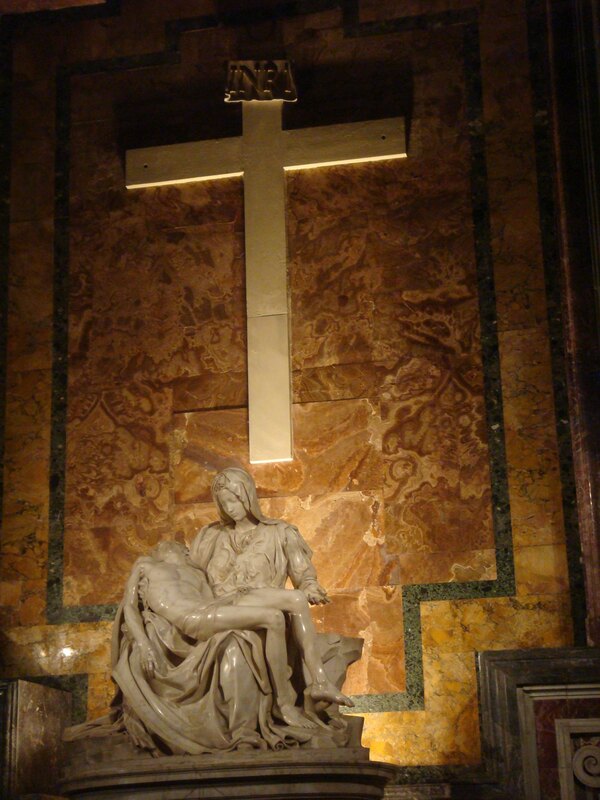 The Pieta chapel is the most visited place in the basilica. Do you have a favorite Michelangelo masterpiece you’d like to share? We’d love to hear from you in the comments box below. Sharing is fun: if you enjoyed reading this, pass it along to someone else who might enjoy it as well! We thank you for visiting our blog and hope to be of service to you in the future. Looking forward to seeing you in Rome!